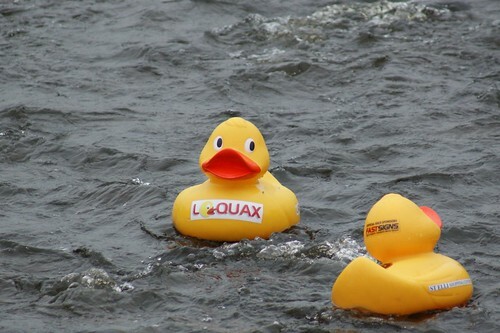 We’re pleased to announce the launch of the first Loquax Annual Transatlantic Duck Race. Inspired by the Great British Duck Race, Quacky Races, and the O2 advert we thought that duck races needed to be done on a worldwide scale. Instead of ducks floating down The Thames we think it would be much better, and much more exciting to do a global event – a duck race across The Atlantic and shown live on TV and the internet. 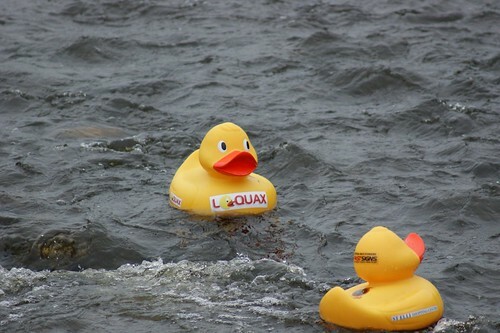 Recent sea trials using larger size ducks have been reasonably successful. Attracting spectator interest for such a large scale event promises to be a challenge, but we’ll be using the latest Formula 1 video technology so we can reach out to a global audience. Each duck will be fitted with a GPS device and onboard camera allowing spectators the opportunity to watch the action via streaming video on the internet. Television rights for the event are already being bid upon by Sky, Virgin Media and The BBC. With the ground work in place, we now need business community support. This kind of project can’t get off the ground without any ducks so we are now seeking corporate sponsors for the 10000 ducks who will begin the journey from Southampton to (hopefully) New York on 1st April 2011. Naming rights for the event and other corporate deals are available. We also hope to run “duck race cruises” so that people can see the action close up and personal on the ocean wave. As a competition site we’ll also be making sure there are plenty of prizes on offer to our users. This will include the chance to win a duck to race, a chance to get the transatlantic duck race underway and a trip to New York to be at the finishing line. The next 12 months promise to be very exciting for Loquax as our month’s of hard work and planning start to come to fruition.